Dewa Ruci Statue physically have the aesthetic appearance. Because the sculpture is seen in the whole group of Balinese mythology. And it is located in a very setrategis in Bali. In the Dewa Ruci Statue, there are some features that look. The top one is Dewa Ruci / Nawa Ruci, which is protected by an aura. And the most visible figure in the statue is Sang Bima ridden by a dragon, Naga Baruna. They fight in the middle of the sea. Dewa Ruci Statue very stately and sturdy stand in the middle of the intersection was jammed full of vehicles. Currently in the basement, just below Dewa Ruci Statue, created underpass. 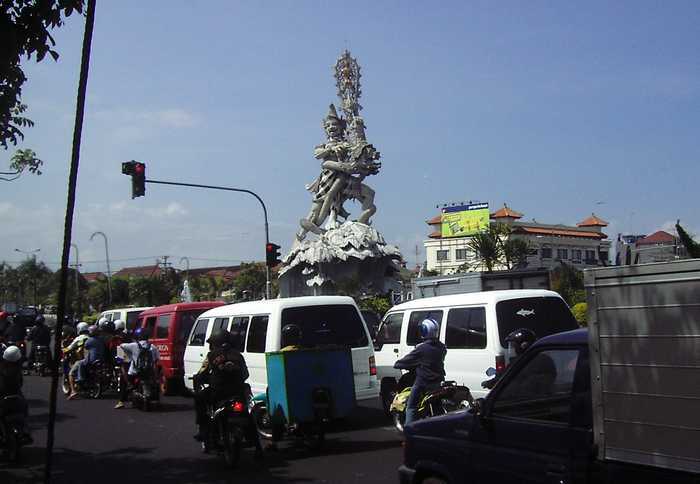 To address congestion very often occur in areasDewa Ruci Statue. In the area Dewa Ruci Statue frequent jams that would make us stress. Especially over the road from Nusa Dua toward Sanur, or through By Pass Ngurah Rai. Congestion often occurs, even tens of kilometers. It happened because the intersection is the meeting of Dewa Ruci Statue tourist cities in Bali. The statue became an icon of the solid and the breakdown of the road in Bali. Especially in the tourism centers of Bali. Every Balinese, who hear the word statue Dewa Ruci, then that is in the mind is a very bad roads, intersections are confusing, stressful, crowded. Many people avoid this intersection. But what may make, there is no other option to get to the location to go through this intersection.